Congratulations to the Rose Gardens team this year who were fantastic. Prospector clean! clean! clean! and very friendly! The staff at Goldminer were courteous, helpful and professional. Third time lucky. 1st park dog unfriendly, 2nd a sardine park, The Prospector excellent from the moment we walked into the office. Kylie and Zane now at Pine Grove very keen. Returned our call straight away. Very friendly staff, found them to be better than the last 30 parks i have been to in 4 months. More parks should follow the attention these guys give. Rose Gardens a friendly and well supervised park. Jock is a legend, he can back a 5th wheeler into the smallest of spaces. Cheerful and friendly staff at Albany Holiday Park. Ready to give information on places to go and things to see. My wife and I had a very nice stay at this campsite, we would definitely recommend your services. Very friendly & helpful even outside of work hours. Lots of tips & general knowledge that we found helpful. The staff are very welcoming and so friendly at Prospector. 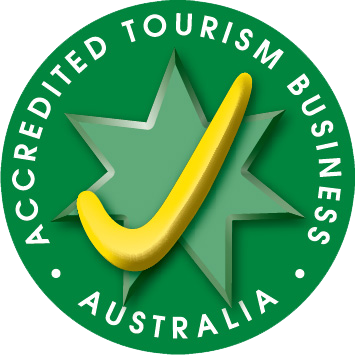 Acclaim Holiday Parks offer the discerning guest a wide variety of accommodation throughout their friendly parks across the Perth and Swan Valley area, the Great Southern and Golden Outback of Western Australia. From powered sites for large caravans, many with ensuites, to budget cabins, chalets, beach villas, spa villas or larger family accommodation, you will find your perfect holiday site with Acclaim. 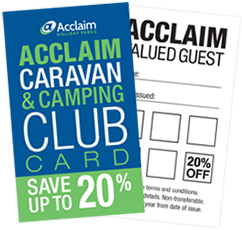 Ask about our free Acclaim Caravan & Camping Club Discount Card. Sign up to our newsletter for all the latest specials.